Mrs. Beatrice Roelofs, age 86, of Cedar Springs, went home to her Lord and Savior on Sunday February 7, 2016. She was born to Bert and Grace (Walma) Boersen on July 24, 1929 in Zeeland, Michigan. Beatrice enjoyed reading, word search puzzles, cross stitch, feeding the birds and gardening. However, most of all she enjoyed spending time with her family and friends. She will be sadly missed and fondly remembered by all who knew her. Beatrice is survived by her children, Linda (Bruce) McGoffin, Gary (Susan) Roelofs, Martin (Sally) Roelofs, Gloria (Gerry) Gebhardt, Sandra (Ron) Starr, Beth (Mitchell) Cole and Douglas Roelofs; many grandchildren and great-grandchildren; brother, Richard (Thelma) Boersen. She was preceded in death by her parents; husband, Howard; infant daughter, Susan; son, Donald in 2015; and several brothers and sisters. A time of visitation was held with the family from 5:00 pm to 8:00 pm Wednesday, February 10, 2016 at the Pederson Funeral Home, 127 N. Monroe St., Rockford, MI 49341. The funeral service will be 11:00 am Thursday, February 11, 2016 at Cedar Springs United Methodist Church, 140 S. Main St., Cedar Springs, MI 49319. Those wishing to offer expressions of sympathy are encouraged to donate to Spectrum Health Hospice, 4500 Breton SE, Bretwood Centre, Grand Rapids, MI 49508. Mr. Donald Jon Roelofs, age 62 of Howard City, passed away unexpected Thursday, November 26, 2015, at his home. He was born to Howard and Beatrice (Boersen) Roelofs on October 6, 1953, in Zeeland, Mich. He served his country and flag in the United States Army. Don worked for Blackmer Pump for 30 years. In his free time, he enjoyed fishing and driving his dune buggy on the sand dunes at Silver Lake State Park. He also enjoyed walking the Lake Michigan beach and watching the sunsets. He is survived by his soul mate, Kathy; mother, Beatrice; brothers, Gary (Susan) Roelofs, Martin (Sally) Roelofs, Douglas Roelofs; sisters, Linda (Bruce) McGoffin, Gloria (Gerry) Gebhardt, Sandra (Ron) Starr, Beth (Mitch) Cole. He was preceded in death by his father, Howard; sister, Susan. There will be a time of visitation with the family from 5:00-8:00 pm Tuesday, December 1, 2015, at the Pederson Funeral Home, 127 N. Monroe St., Rockford, MI 49341. The funeral service will be 11:00 a.m. Wednesday, December 2, 2015, at the Pederson Funeral Home. There will also be a time of visitation one hour prior to the service. Those wishing to offer gifts of sympathy are encouraged to donate to a charity of your choice in Donald’s name. Arrangements by Pederson Funeral Home, pedersonfuneralhome.com. 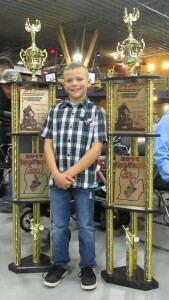 Trentyn Roelofs, age 8, had a great first year of dirt bike riding, earning enough points to place second in the state in both the 50cc senior class and 50cc sport class. The Beach third-grader started practicing on his new KTM bikes in March when there was still snow on the ground and continued to dedicate time to his riding through the cold and rain until the season started in April. He traveled all over the state to compete, culminating in the SJO state fair series last month. 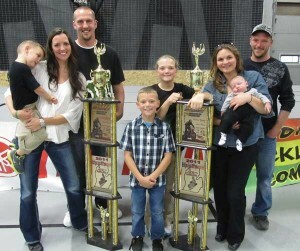 Trentyn is shown here with his trophies and his big family: brother Jaxen with mom Brooke, Step-dad Jeremy, sister Alyssa, Step-mom Sarah with brother Karson, and Dad Brent. Trentyn is the son of Brooke Roelofs and Jeremy Robinson, and Brent & Sara Roelofs all of Cedar Springs. Brent and Sarah Roelofs, of Cedar Springs, are pleased to announce the birth of their son, Karsen Kenneth. Karsen was born on September 5, 2011 at Spectrum Health Butterworth at 11:54 pm. He weighed 8 pounds and 3.2 ounces. He was welcomed home by his sister, Alyssa and brother, Trentyn.